This awareness ribbon will do the talking for you. It features all of the words that give inspiration and hope to those fighting for a cure. This design comes available on our 100% cotton, machine washable t-shirts. Machine washable in youth sizes XS-L & adult sizes S-3XL. 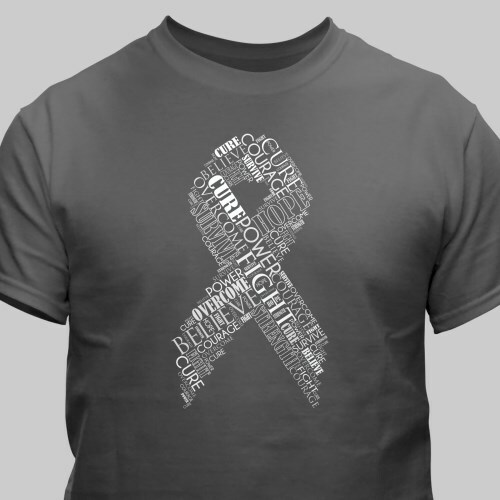 Whether your looking for your ribbon color cancer shirts, something for MS, Alzheimers or another cause, this shirt shares awareness. Very stiff upon delivery but once I washed in cold water as instructed, it softened up. Great looking shirt. Just wish they offered personalization for this one.